Renowned as one of Scotland’s best full backs, Maurice Malpas was truly a one club man having spent his entire playing career with Dundee United. Having signed as an S – Form in 1978, Maurice would make his first team debut for the club on 21st November 1981 and just seven days later earned a place on the bench when United played in the 1981 Scottish League Cup Final. This was the start of a distinguished career which would continue to the year 2000. Malpas would chalk up an impressive 830 appearances and his club honours include a League Championship winner’s medal in 1983 and a Scottish Cup winner’s medal in 1994, when he became the first Dundee United captain to lift the famous trophy. Maurice would play in a further four Scottish Cup finals and two Scottish League Cup finals. He was also a member of the Dundee United team which reached the semi final of the European Cup in 1984 and was a UEFA Cup finalist in 1987. 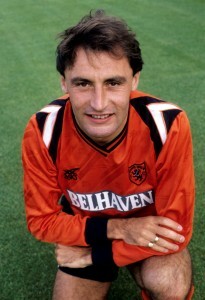 His impressive performances with the Tannadice club were recognised in 1991 when he received the Scottish Football Writers Player of the Year Award. His international career kicked off in 1984 against France and continued up to 1992 when his final appearance against Italy brought him to 55 caps. During his time with Scotland Malpas would play at the 1986 and 1990 World Cup tournaments and the 1992 European Championships.